Undeniably loud. 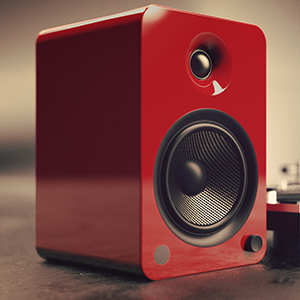 Satisfy your craving for powerful, full-impact sound with YU6. 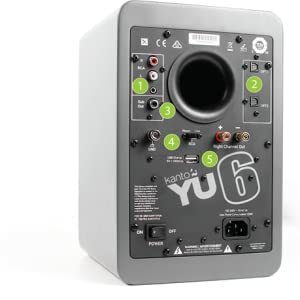 Armed with a formidable Class D amplifier pumping out 200W peak power, YU6 will have you questioning what it really means to be loud. Its 5.25” Kevlar drivers and 1” silk dome tweeters inject detailed sound into every square inch of living space, evoking emotions that can only be expressed with an ear-to-ear grin. A built-in phono preamp makes it easy to spin your favorite tunes, while Bluetooth connectivity lets you keep the party going from the palm of your hand. 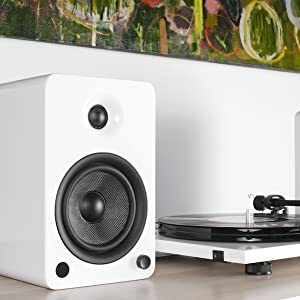 Elegant Design Kanto speakers incorporate an aesthetic centered around two modern design principles: simple form factor and use of premium materials. Carefully sanded cabinets, woven Kevlar drivers and eye-catching silk dome tweeters provide more than something to listen to. Together they embody a passion for both sound and design. Remote Control Packed with functionality, the YU series remote makes listening to music more convenient. Quickly switch between sources, tune your sound to fit your space, and control playback while streaming via Bluetooth.Turntable-ready Inspired by an equal appreciation for digital and analog, YU6 gives you the freedom to throw on your latest vinyl with a built-in phono preamp. Connectivity RCA & AUX INPUTS Compatible with virtually all audio devices, RCA and AUX ports provide a quick and easy way of connecting to your source. OPTICAL INPUTS Enjoy the best sound your digital devices have to offer with two Optical TOSLINK ports. SUBWOOFER OUTPUT For additional bass, plug a subwoofer into the SUB OUT port. PHONO/LINE SWITCH A built-in phono preamp allows you to plug a turntable directly into your speakers. Flip between Phono and Line inputs with a single switch. USB CHARGE PORT Keep your phone charged with a 5V USB port to ensure you never miss a beat. Bluetooth Enabled Featuring built-in Bluetooth with Qualcomm aptX technology, YU6 allows you to sit back and enjoy your newly curated playlist from the palm of your hand. Undeniably loud. Satisfy your craving for powerful, full-impact sound with YU6. Armed with a formidable Class D amplifier pumping out 200W peak power, YU6 will have you questioning what it really means to be loud. Its 5.25” Kevlar drivers and 1” silk dome tweeters inject detailed sound into every square inch of living space, evoking emotions that can only be expressed with an ear-to-ear grin. A built-in phono preamp makes it easy to spin your favorite tunes, while Bluetooth connectivity lets you keep the party going from the palm of your hand. Kanto speakers incorporate an aesthetic centered around two modern design principles: simple form factor and use of premium materials. Carefully sanded cabinets, woven Kevlar drivers and eye-catching silk dome tweeters provide more than something to listen to. Together they embody a passion for both sound and design. Packed with functionality, the YU series remote makes listening to music more convenient. Quickly switch between sources, tune your sound to fit your space, and control playback while streaming via Bluetooth. Inspired by an equal appreciation for digital and analog, YU6 gives you the freedom to throw on your latest vinyl with a built-in phono preamp. RCA & AUX INPUTS Compatible with virtually all audio devices, RCA and AUX ports provide a quick and easy way of connecting to your source. OPTICAL INPUTS Enjoy the best sound your digital devices have to offer with two Optical TOSLINK ports. SUBWOOFER OUTPUT For additional bass, plug a subwoofer into the SUB OUT port. PHONO/LINE SWITCH A built-in phono preamp allows you to plug a turntable directly into your speakers. Flip between Phono and Line inputs with a single switch. USB CHARGE PORT Keep your phone charged with a 5V USB port to ensure you never miss a beat. Featuring built-in Bluetooth with Qualcomm aptX technology, YU6 allows you to sit back and enjoy your newly curated playlist from the palm of your hand.